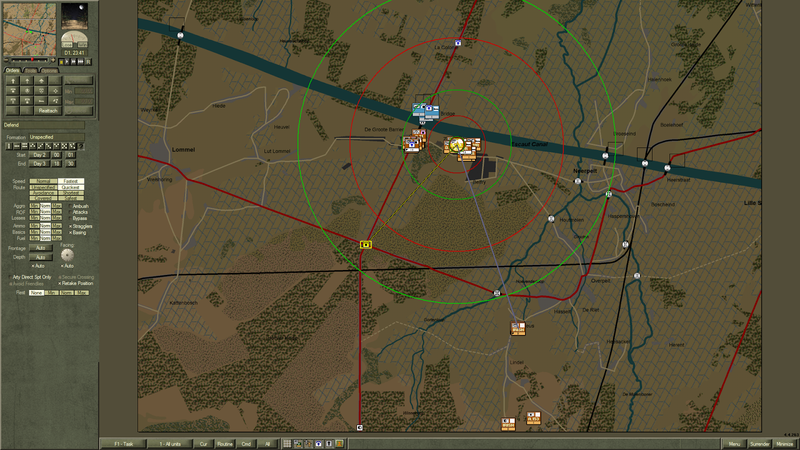 Setup details for the scenario. I've left things as historical as possible. Initial positions. The objectives are either end of the DeGroot Bridge, and the town of La Colonie. The other canal bridges are all destroyed. 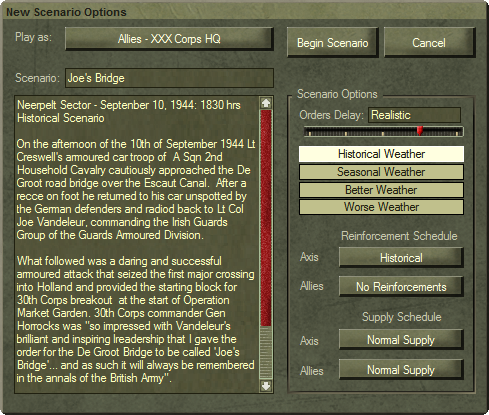 I have two battalions of the Irish Guards Regiment and supporting units. My operational plan is to first advance A Squadron of the 2nd Household Cavalry to the Zinc Factory to observe the bridge and provide covering fire for my advance. 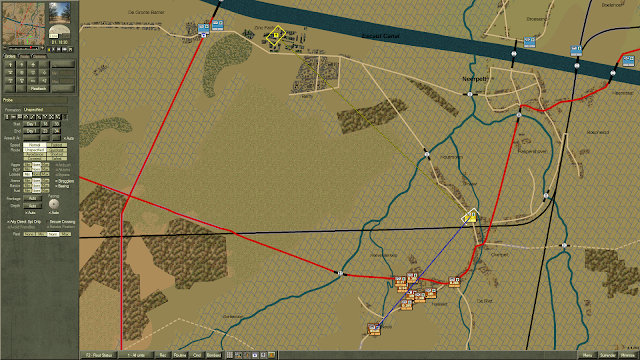 I will then move the 2nd Battalion west to the crossroads and have them prepare for an attack up the elevated highway on the DeGroot Barrier objective. Meanwhile, 3rd Battalion, my most powerful striking arm, will move to the Zinc Factory where it can provide support by fire to the 2nd Battalion's advance, against any German units that try and reinforce the south end of the bridge. 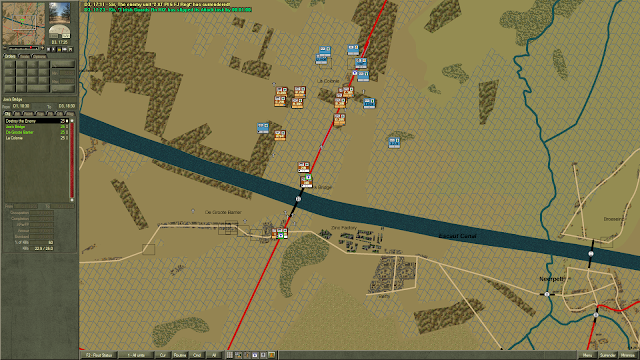 2nd Battalion begins to advance while 3rd Battalion takes up positions in the Zinc Factory. It's getting dark and we're losing visibility. 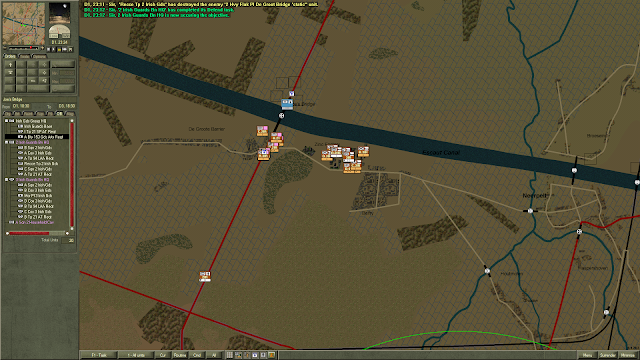 I'm hitting the south end of the bridge with artillery and air strikes in preparation for 2nd Battalion's attack. 2nd Battalion brushes aside weak resistance and consolidates on the objective. 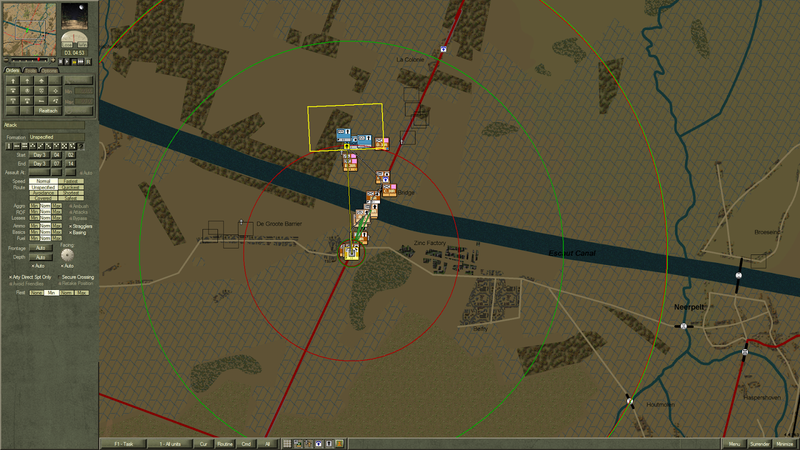 There are undetected enemy units in the area, however, and control remains contested. 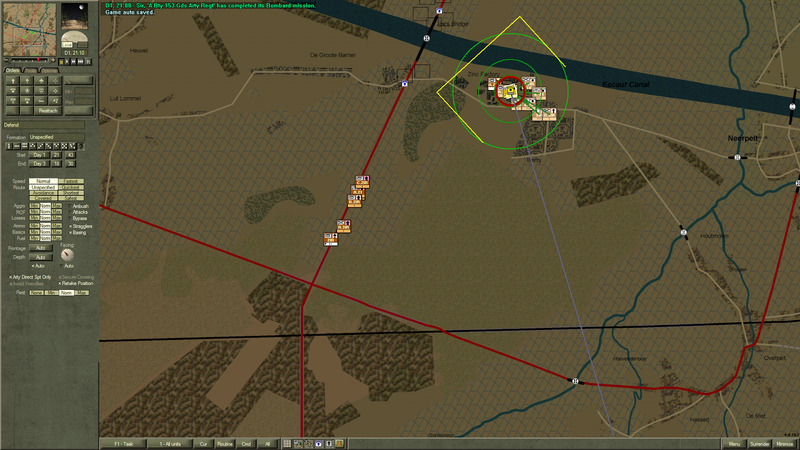 This is my first mistake: I should have moved 3rd Battalion in closer, earlier. I move A Squadron 2nd Household to guard the crossroads to the south and provide some flank security and early warning of any enemy movement from that direction. 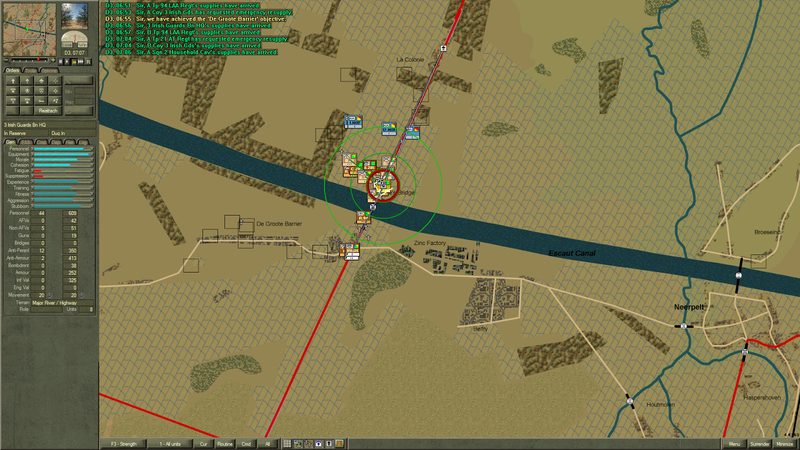 Around 0100, I order an attack by 3rd Battalion across the bridge, to begin at 0330. My hope is that the troops will be well rested and I can quickly force the crossing. Unfortunately, the Germans have other plans and begin a counter-attack at the same time my attack is scheduled. The south end of the bridge quickly turns into a pitched battle between elements of III Bn. KG Hoffman and my two battalions. By 0500, all of my forces are engaged. The Germans take heavy casualties and the approaches to the bridge are open by 0800. However, another attack is developing to the west of the DeGroot Barrier objective. I order 2nd Battalion into a counter-attack, backed by air strikes and artillery, to stop it well short of the objective. By this time I've also moved the regimental HQ and support units up to the DeGroot Barrier. 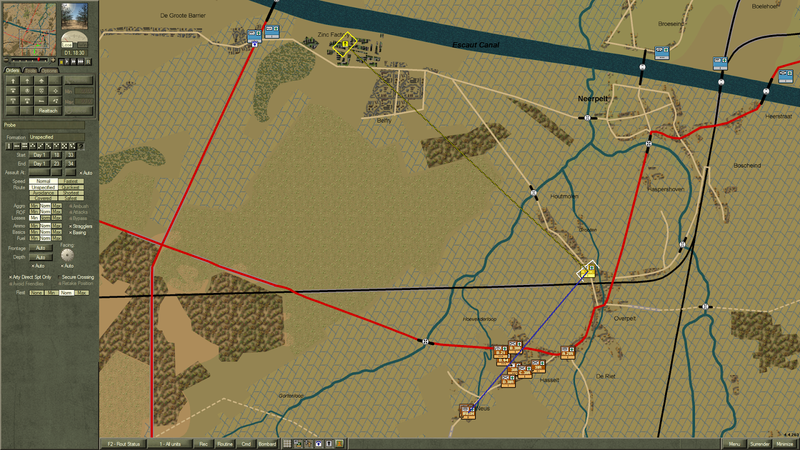 ...and a further six hours before I have the bulk of the exhausted 3rd Battalion across. Meanwhile 2nd Battalion has seriously depleted the German forces to the west. 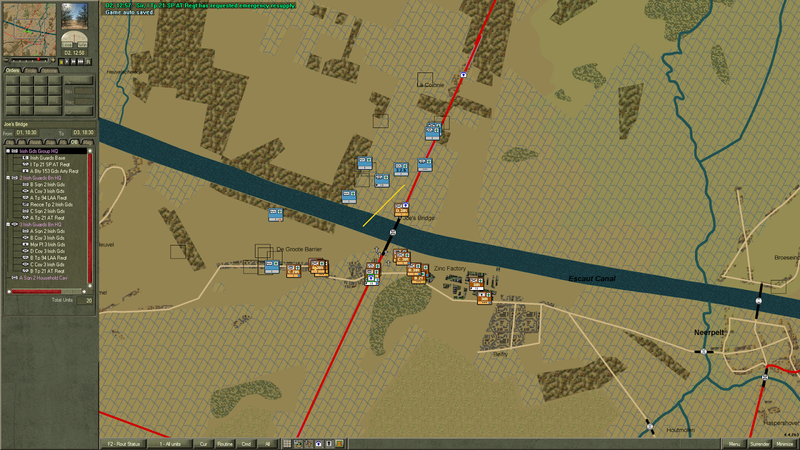 Now that I'm across the canal, my plan is to push 3rd Battalion north along the elevated highway to take La Colonie, while the regimental HQ and support elements hold the south end of the bridge against any weak attacks the remaining Germans might throw at me. There is most of an intact battalion of KG Hoffman to the west. 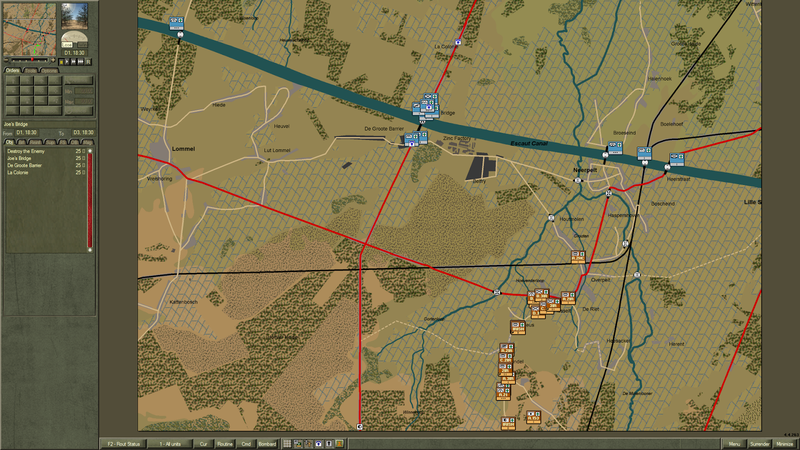 I will attack with the rested 2nd Battalion to push them away from 3rd Battalion's line of advance. 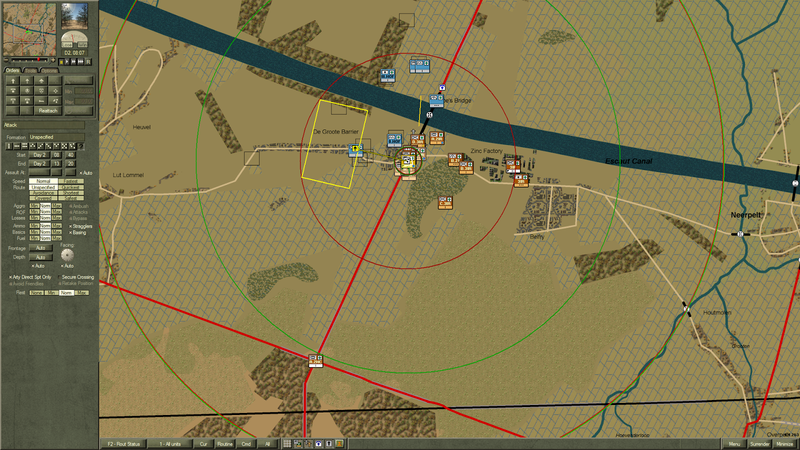 Moving the 2nd Battalion up provides enough force to take the "Joe's Bridge" objective, as well. Around 0700 3rd Battalion begins advancing up the highway. 2nd Battalion moves to the left flank to screen their advance. The troops left on the south side of the canal beat off several weak German attacks throughout the morning. 3rd Battalion's attack repeatedly stalls. Here, I should have redirected 2nd Battalion to more effectively support the left of 3rd Battalion, and taken manual control of my artillery to blast pockets of resistance. At 1830 I'm still about half a click short of the La Colonie objective. 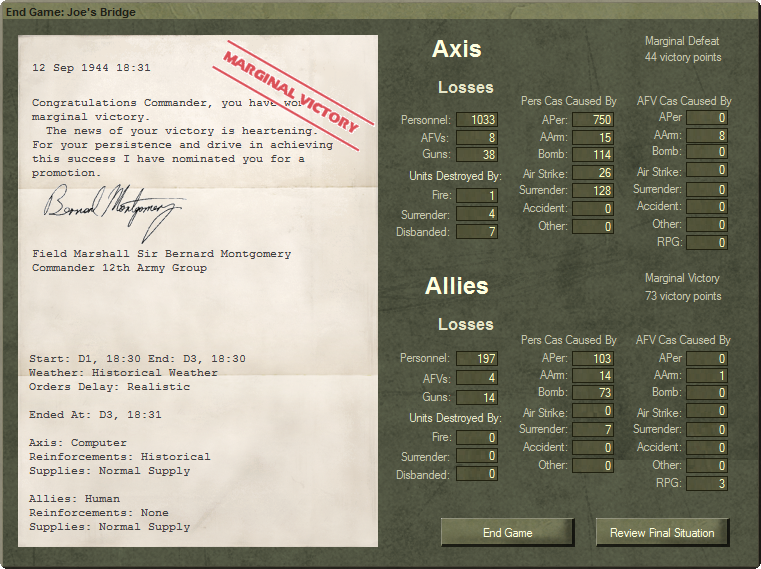 I've taken a fearful toll of the Germans, but not enough to qualify for the "Destroy the Enemy" objective. 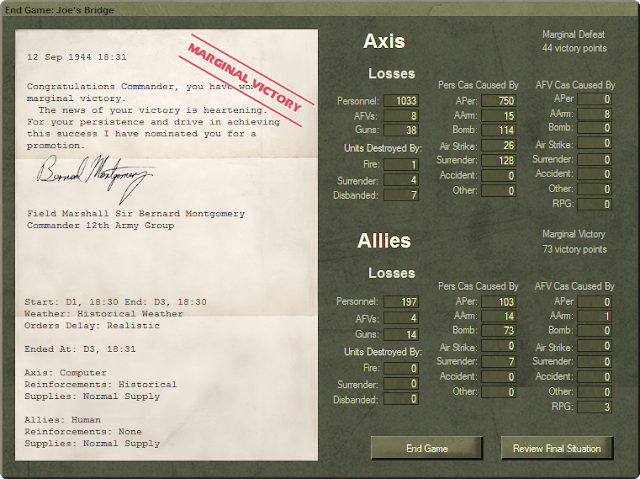 Either taking the La Colonie objective or destroying sufficient Germans would have netted me a Decisive Victory. As it is, given my rather sluggish generalship, I'll take the Marginal Victory and be happy. Clearly, no one will be naming a bridge after me! Doug this was great. You did as good a job if not better than I did! I misread the map when I played. I thought those bridges to the east over the canal were still standing. You also handled their counterattack well. That didn't happen to me so it was interesting to see that the AI tried to pull that off. I really like this scenario. I think it's one that might be worth trying to play as the Germans. Great AAR! Thanks Chris. This is a great scenario. Relatively quick to play but challenging.